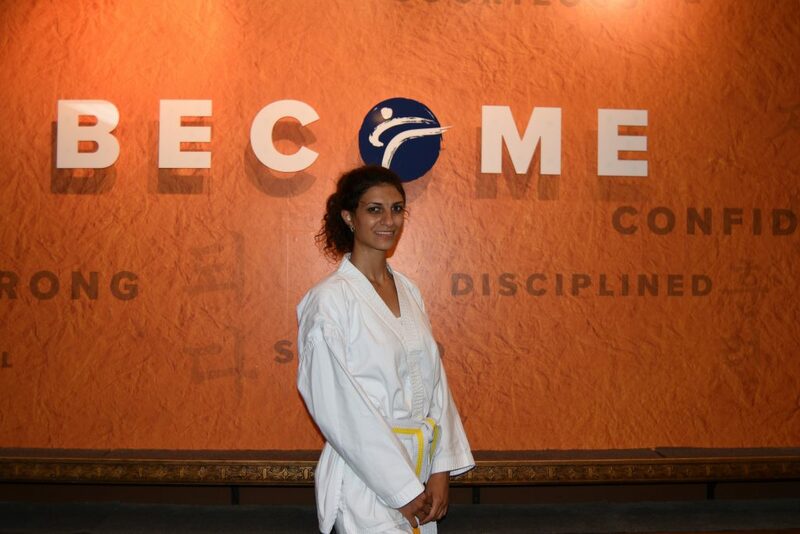 Why did you choose Tae Kwon-Do? Growing up in Asia, I never had the chance to do sports or any other extracurricular activities. Both my parents worked because everything was so expensive. I remember wanting to do something special like ballet, or anything, but my family couldn’t afford it. I came to the United Staes, earned a bachelor degree in physical education, and work as a hygienist. It’s a great job that I love, but it can be very stressful. There’s lots of work. All day I listen to patients and about their problems. I love helping them, but I found myself coming home completely drained. I didn’t have any energy for myself. Tae Kwon-Do made me a better person. Better on the outside. The training involves lots of physical activity. I’m working out and in the best shape of my life. Now I finish work and have the energy to go out and do things instead of crashing on the couch. I have the confidence and strength to defend myself. When it comes to any physical challenges, my body is ready to accept what comes my way. I’m better on the inside as well. I’ve learned how to bring more control into my life. No matter how bad the situation can be, we all have the ability to make it better. You learn how to focus and view your challenges. Lots of bad stuff happens in life. It’s all about how you respond, how you treat it, how you work with it. Why do you like Master Gorino’s Tae Kwon-Do? Master Gorino made me feel like family. He’s not only a Master at Tae Kwon-Do, he motivates you. He truly wants you to succeed in life. It’s not just kicking and punching. There’s a deep inspiration on how to be a better person. My goal is the black belt. It’s a symbol of accomplishment, but it’s more than that. It’s about the person behind the belt. I may not always win, but I never lose because I’m always learning. Tae Kwon-Do is about learning and will make you a better person, inside and out.